Izzy Ezagui is an American-born decorated squad commander in the Israel Defense Forces. Just after finishing his military training in December of 2008, Izzy was guarding the border of Israel and Gaza and was hit by a mortar, ripping his left arm from his body. He underwent emergency surgery immediately at Soroka Medical Center in Beersheba. Such an injury would have ended a military career for most men, but not Izzy. Ignoring his doctors, Izzy fought harder than ever before to recover and return to full combat duty. To his knowledge, he is the only soldier with his disability to return to full combat service. Though he had to cut through miles of bureaucratic red tape, his resilience and determination paid off. Taking his family with him, Izzy moved from Miami to Israel in August of 2007. While his family did not immediately become Israeli citizens, Izzy made aliya right away and immediately enlisted in the army. Izzy is an inspiration to friends and soldiers, and now that he has been discharged and returned to civilian life, he’s focused on doing the same for others. Continuing to serve in an elite unit in the reserves, Izzy also delivers inspirational talks across the globe. He’s appeared on The Huffington Post, Al Jazeera America, Fox News, and Israeli National News. He also gives motivational speeches for the Friends of the Israel Defense Forces and other organizations, and spends time with young people on birthright Israel trips, just as soldiers did with him. His memoir “Disarmed” is set to release next Spring. 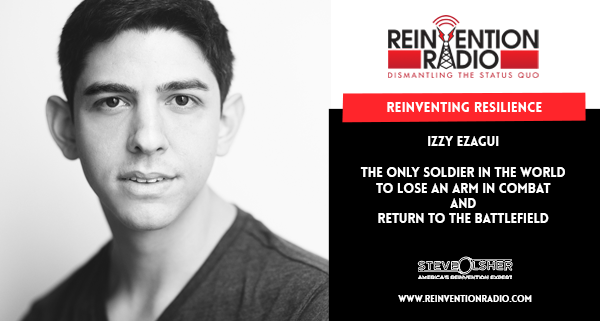 TUNE IN to this episode as Izzy chats with Mary and Richard about resilience and how he battled back after losing his arm to return to the battlefield and combat. Reinventing the American Dream – In this episode, the Reinvention Radio Crew talks with Toan Lam chats with Steve, Mary and Richard about his family’s escape from Vietnam and creating a new life in America.